Scroll down to Book your sponsorship. Besides the public recognition for your organization joining a distinguished list of concerned community players, and uniting for a vital cause, sponsorship makes a difference in the effort to head off the looming crisis of our fresh water sources becoming unusable. 92% of our drinking water sources are in peril. Our aquifer, springs and rivers are suffering from increasing pollution and declining flows. These changes result from the over-pumping of our groundwater, pesticides, and the drainage of nitrates from lawn fertilizers, pet waste, poorly-treated sewage, and unmaintained septic tanks, which flow directly into our waters. Volusia County depends on population growth for prosperity, but growth does not have to mean unnecessary water use and increasing pollution. With more knowledge, residents can make better choices to conserve and protect this essential, natural resource—our water. Every sponsorship dollar goes straight to the costs of Volusia Water Alliance’s efforts to educate the community on the growing problems that must be addressed if we are to continue to enjoy our fresh water in the coming decades. 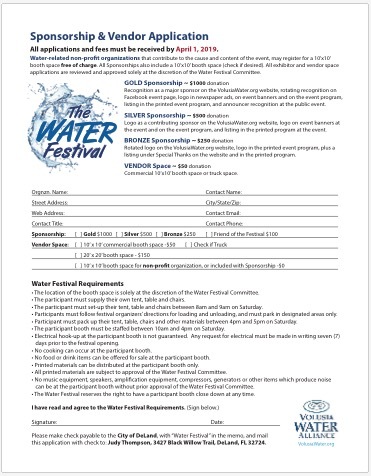 No one in the Volusia Water Alliance is making money with this, but is investing to help produce events that are free to the public, print educational materials, engage our youth, and help get the word out that, together, we can fix this. We hope you will join us. If you would like to have a booth at the event, you must download and complete the Vendor Application and send back for approval. 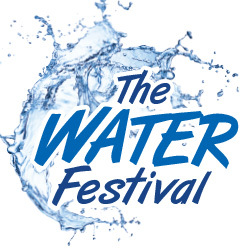 Non-profit organizations that are water related may have a booth at no charge. Other vendors must apply and be approved by the committee. Please download and complete the application which also includes guidelines for booth setup. All Sponsorships also include a 10’x10′ booth space, if desired. Application must still be sent in to reserve your booth space. Click here to download the vendor space application.